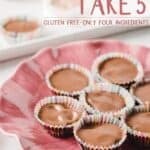 My favorite candy bar, the Take 5, has gone gluten free! And Guess what?! Only four easy ingredients! I took going gluten free in great stride. That doesn’t mean I don’t miss my favorite treats & guilty pleasures! The Take 5 candy bar is arguably the BEST candy bar on planet earth. It’s the salty-sweet combination that makes it mouthwateringly good. The problem? If it weren’t for those stinking PRETZELS it would probably be gluten-free! Don’t you worry, friends. I’ve GOT YOU! So What’s in a Take 5 Candy Bar? See what they did there? Five ingredients. Take 5. To recreate my favorite candy bar, I know I have to swap the pretzel for a gluten-free one. The thing is, if I’m going to make candy myself, it has to be easy because I don’t have the time nor the patience for anything less. I know what you’re thinking… What?! I KNOW! Now let’s put these ingredients together to make delicious homemade Take 5 candy bars! First, spread a little chunky peanut butter on some gluten-free pretzels. About a teaspoon’s worth. Then, line a mini-muffin pan with mini-muffin liners. (Don’t skip that!). 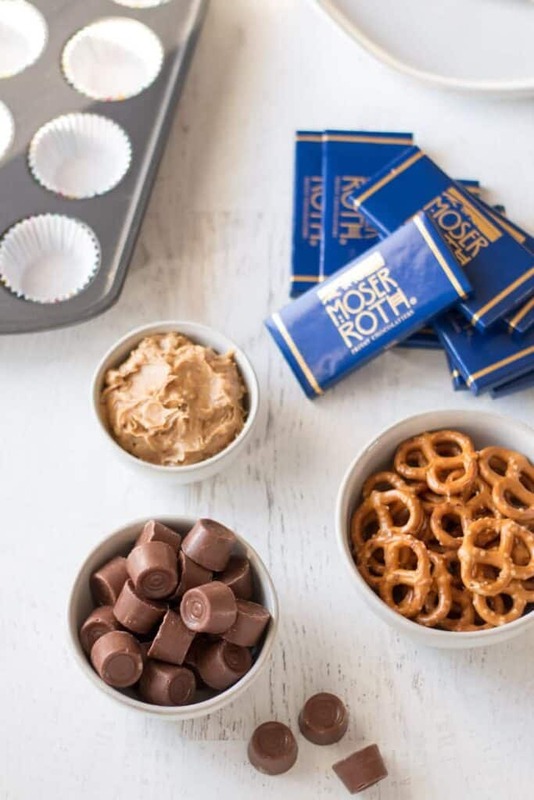 Pop them in the oven for a few minutes to soften the Rolos. Next, press the peanut butter covered pretzel down onto the Rolo. 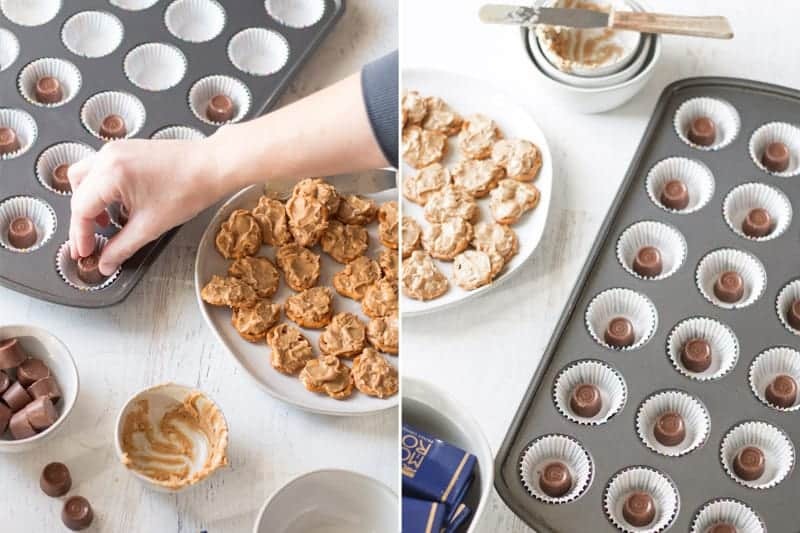 Lightly press it down so that the Rolo spreads to cover the bottom of the muffin tin. Life is looking seriously so good right now. 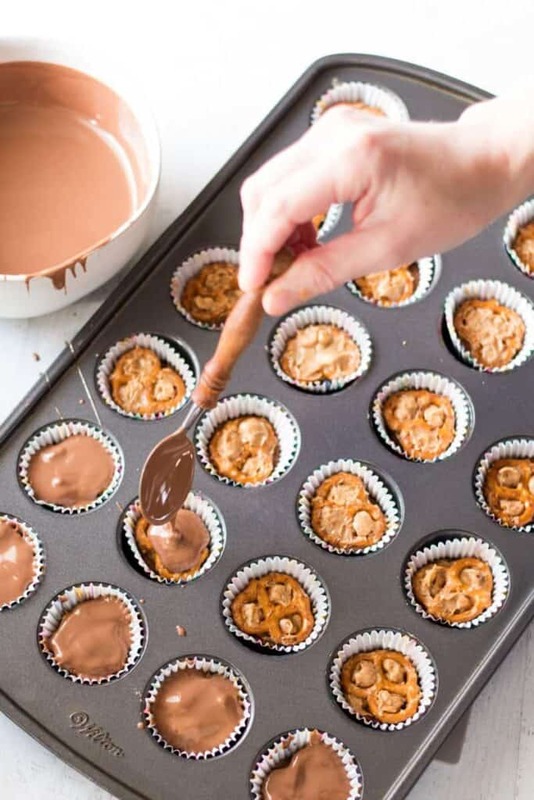 Lastly, drizzle some melted milk chocolate over the melted rolo/peanut butter/pretzel concoction in the muffin tin. Pour enough chocolate to cover the tops. If you don’t like the look of the pretzel peeking through, just pour chocolate until it is level and smooth. I must say, I kind of like the pretzel peeking out a little bit. I mean seriously. Can life get any better than this? The only thing left to do is wait for them to set. Pop them in the freezer if you want to, I get it. 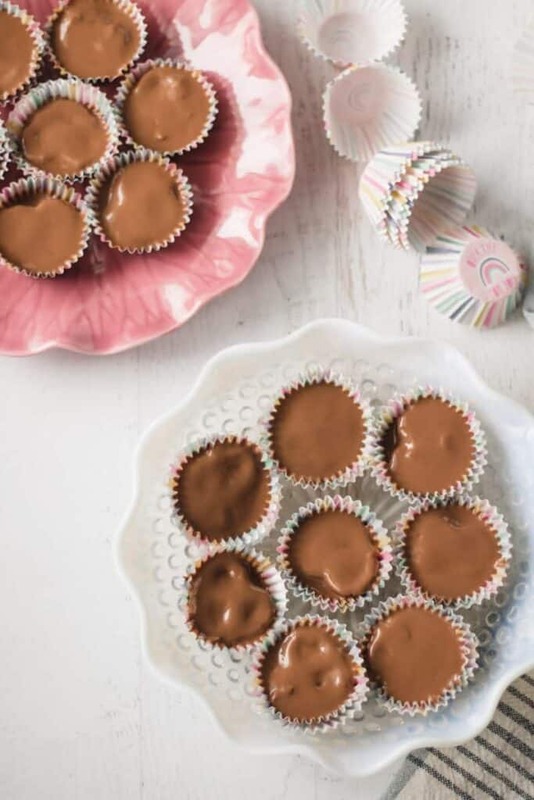 Once the chocolate is hardened, you can take them out of the muffin tin and store the candy in an airtight container. 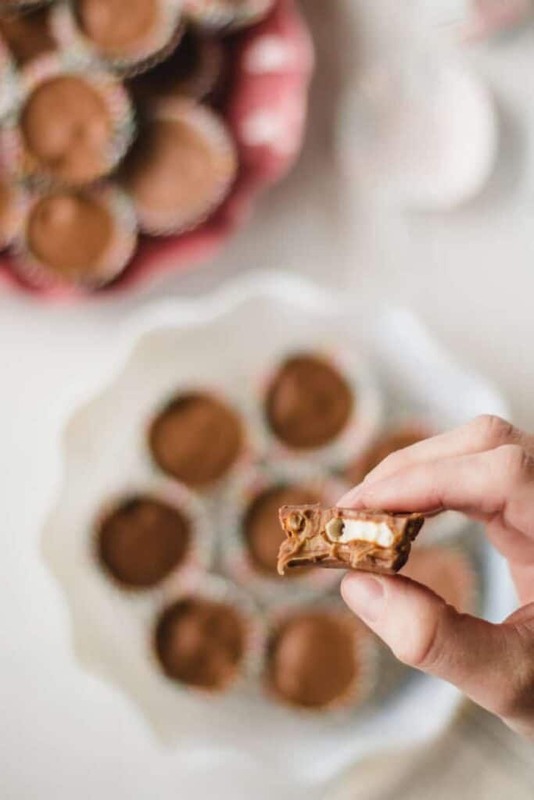 The Take 5 candy bar is arguably the best candy bar ever… and now it’s even better because it’s homemade, gluten-free, and only 4 ingredients! Spread about 1 teaspoon of crunchy peanut butter on each pretzel. Line mini muffin tin with liners. Place a Rolo in each cup. 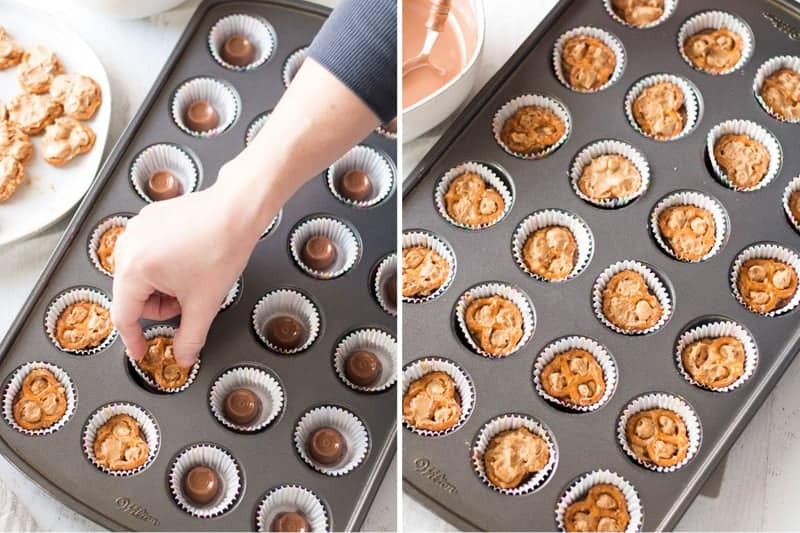 Bake 5 min to soften the Rolos. 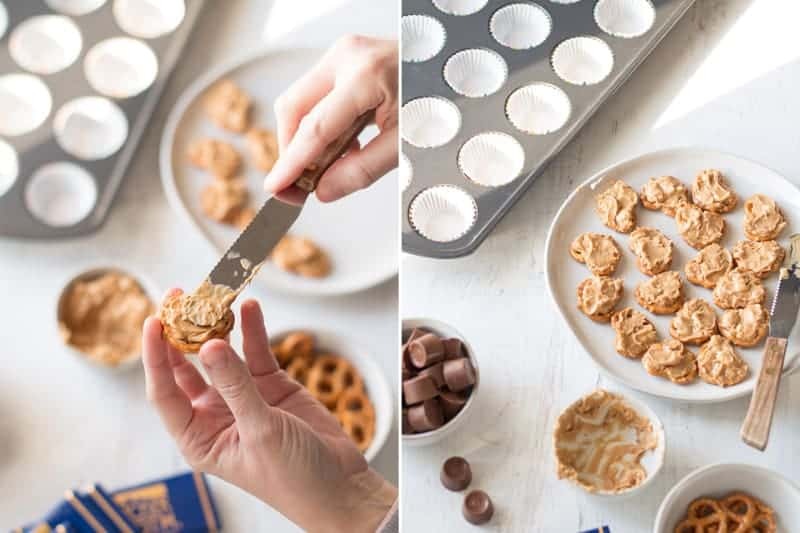 Press a peanut butter coated pretzel down onto each of the melted rolos, pushing slightly to spread the rolo. 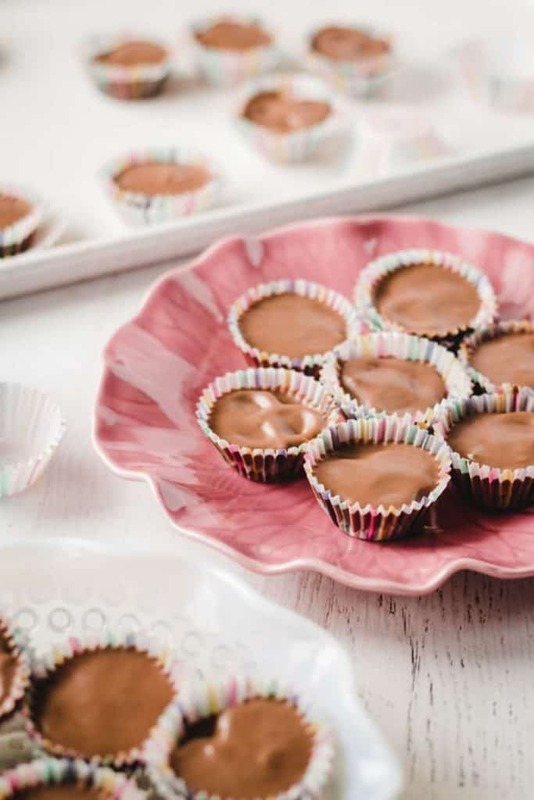 Melt the milk chocolate in microwave or double boiler. 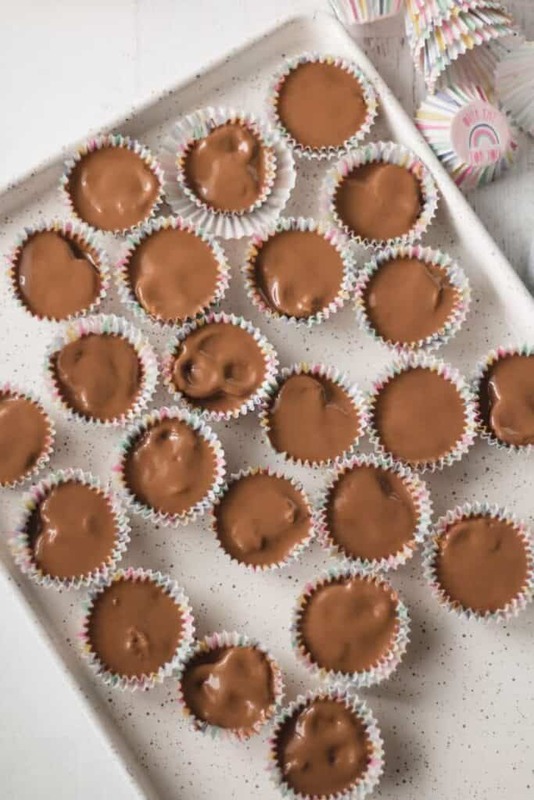 Drizzle milk chocolate over each cup to cover the tops. 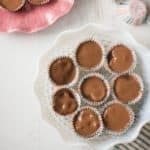 Allow the chocolate to set before removing from the muffin tin. Store in an airtight container. I’m not kidding when I say these are just as good as the originals! Confession, I hid the rest of these from my family. They can go buy their own Take 5’s… these are all mine! Funny post! And these look really good. I’ve never had a Take 5 candy bar. Can’t wait to try these! P.S. I love the dishes. ???? I love the dishes too! !